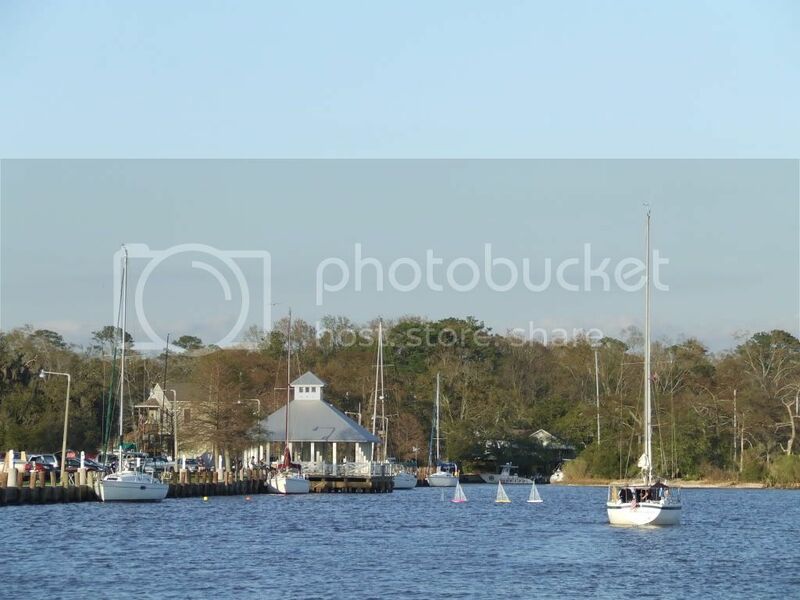 Entrance to Mandeville Harbor - notice the little remote control sailboats! Since taking Nirvana for her very first overnight excursion last November, Ken and I couldn't wait to venture out for another weekend getaway. This past weekend the forecast was partly cloudy skies with temperatures in the lower 70's and winds 10-15 knots. 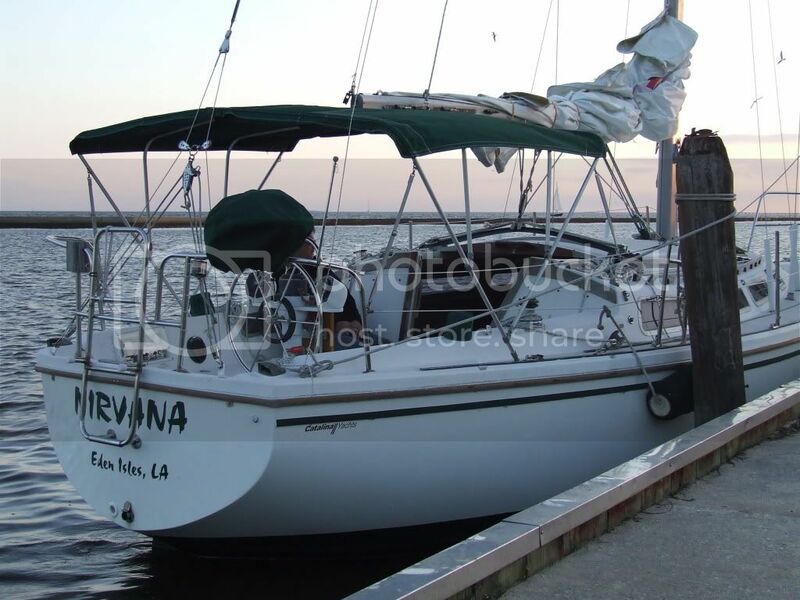 We took advantage of the great weather and sailed Nirvana to a nearby town of Mandeville, LA. 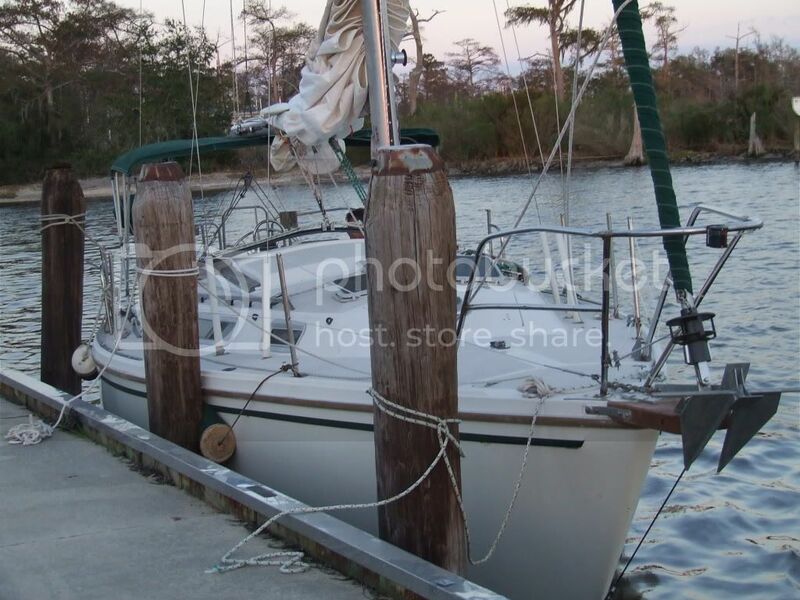 With Mandeville being about a 35 minute drive away, we figured it would take us about 5 hours to sail there. Nirvana left the dock of our backyard right around noon, and we arrived in Mandeville around 5:00 that evening, right as scheduled. However, the trip there didn't involve near as much sailing as we had hoped. 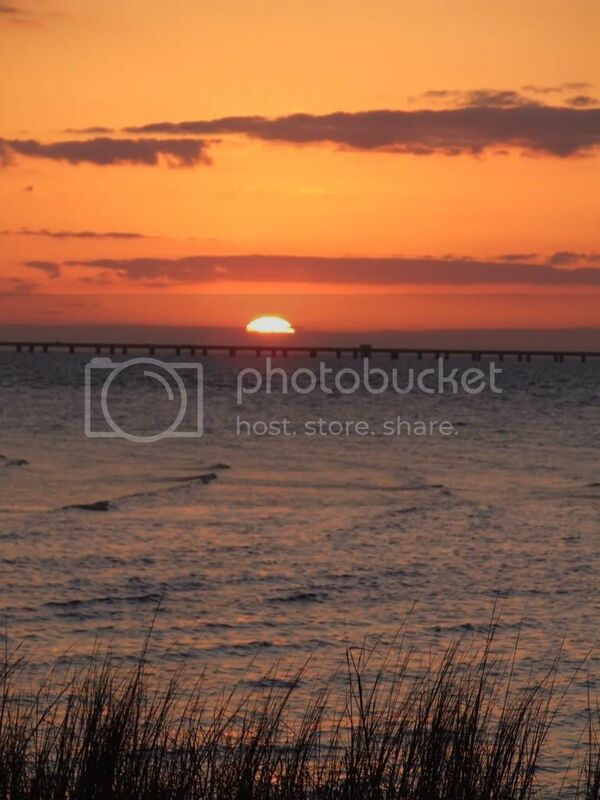 When we first entered Lake Pontchartrain from Slidell, we had a nice wind and we began to experience the rush of excitement that comes with knowing you're gonna have a great sailing day. After passing through the Hwy. 11 bridge, Ken hoisted the sails and the wind just stopped. I mean there was nothing! After a little while, we reluctantly turned on the motor and had to keep it running just about the entire length of the trip. We kept the sails up while we motored, hoping to catch some wind. About the time we could see the Mandeville lakefront the wind was back, and back pretty strong! We were able to sail for about 30 minutes, but the sun was going to be setting soon and we weren't exactly sure where the harbor entrance was. (We don't have our GPS yet and hoping to set up our GPS mouse and Sea Clear in the very near future). While I pointed the bow of the boat into the wind, Ken pulled in the sails. We were both a little nervous, as the wind was really blowing (wish we had a wind gauge), causing the lake to be choppy and rocking Nirvana back and forth. However, Ken took his time and stayed out of the water! 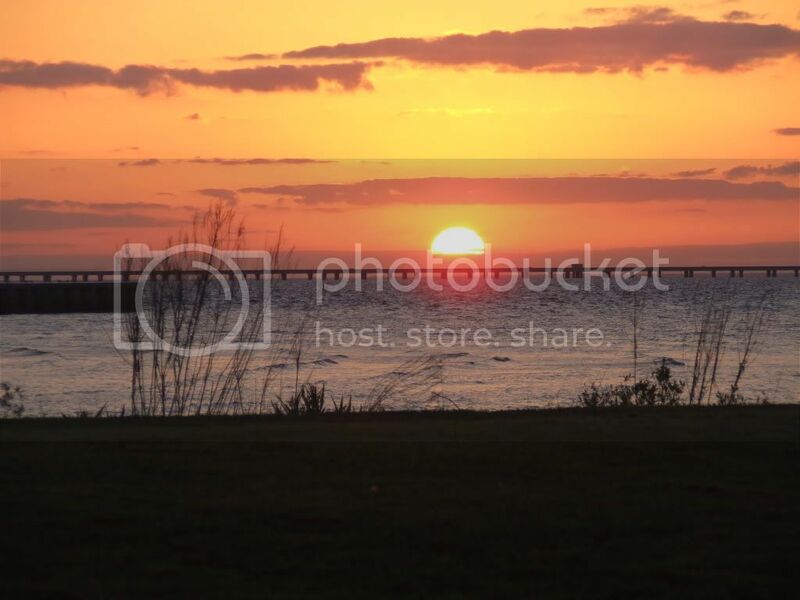 For those not familiar with Lake Pontchartrain, it's a huge 630 sq. mile lake but only about 10-16 feet deep. It is known for its unpredictable wind patterns and mean, choppy waters. 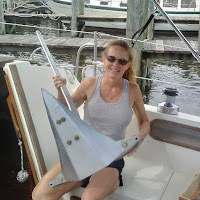 It is said among the local yacht clubs that Lake Pontchartrain is a very challenging lake to learn to sail because the shallow water can cause its conditions to change so quickly. We got a glimpse of this Saturday, as we motored from calm seas and no wind straight into high winds and very choppy waters. In fact, once we were back home we learned that 3 boaters went missing right outside the Mandeville harbor that night, and luckily were found the next day on top of their overturned boat. We're hoping that if we can master sailing in the lake this summer, then we'll be well prepared for the Gulf of Mexico. After pulling in the sails we motored towards shore and spotted the red marker that we were looking for, showing us the entrance to the Mandeville harbor. 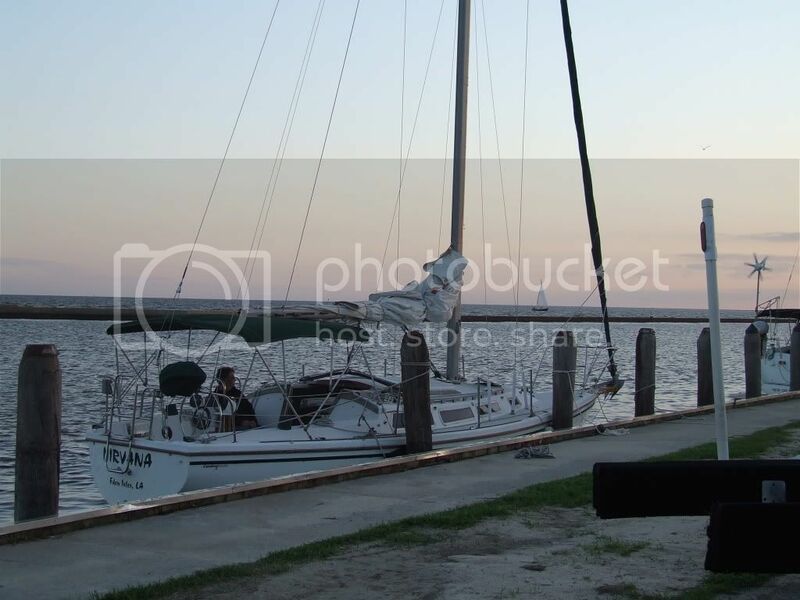 We pulled in and docked the boat across from the Pontchartrain Yacht Club, where one can stay for up to 4 days - for free! This is a really nice place to dock, as it provides a great view of the lakefront and has a nice park lined with live oaks and a paved walkway that goes on for miles. After registering with the yacht club, we walked to the park just in time to catch a beautiful sunset. 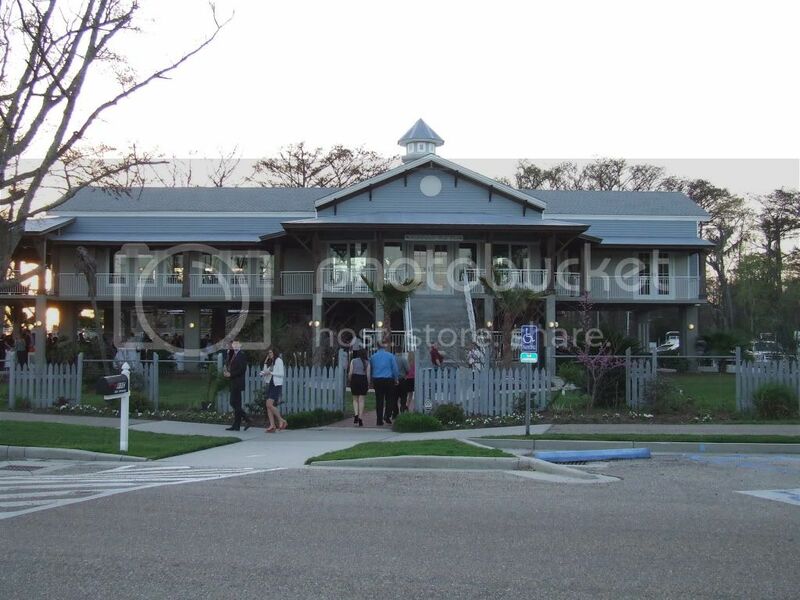 Pontchartrain Yacht Club with wedding going on and lakefront with people (and Ken) enjoying the view! Sunset on the lake and Causeway Bridge - much choppier waters in the distance! After sunset, we headed back to the boat to fire up the grill and cook up some pork chops for sandwiches. I must say that Ken is one heck of a cook, and the sandwiches were excellent! After dinner, we were exhausted and ready for bed by 9:00. We were happy to find that our new mattress topper that we recently put together with some spare foam made for a much more comfortable sleep. 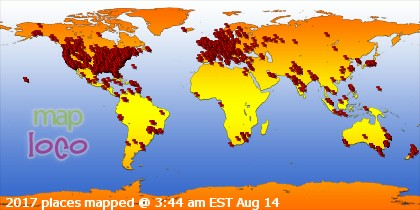 However, we didn't sleep well until after 1:30 that morning due to some really strong winds. We had our fenders in place and they seemed to be holding, but the sound of the howling wind and the boat rubbing on the fenders made us a little uneasy. Just like the winds had picked up so quickly, they died down to nothing and we were finally able to get a good sleep. The next morning we woke up to find that Nirvana's new paint job had survived, but a little bit of the green pin stripe had been rubbed off. We now have two spots to touch up on the green stripe, but we're thankful that we didn't have any other damage. A gentleman in a large Beneteau docked nearby asked how we survived the night and if we had any damage, as he also thought it was an extremely windy night. After pouring ourselves a cup of coffee, we walked along the lakefront for a while then came back to grill some hot dogs for breakfast. No, we don't normally eat such things for breakfast but if we're gonna be real cruisers we have to learn to eat what we've got, right? After what was actually a really good breakfast, we headed out of the Mandeville harbor at 11:45 (lost an hour due to setting the clocks ahead). The passage back was much better, as we were able to sail the entire way home! 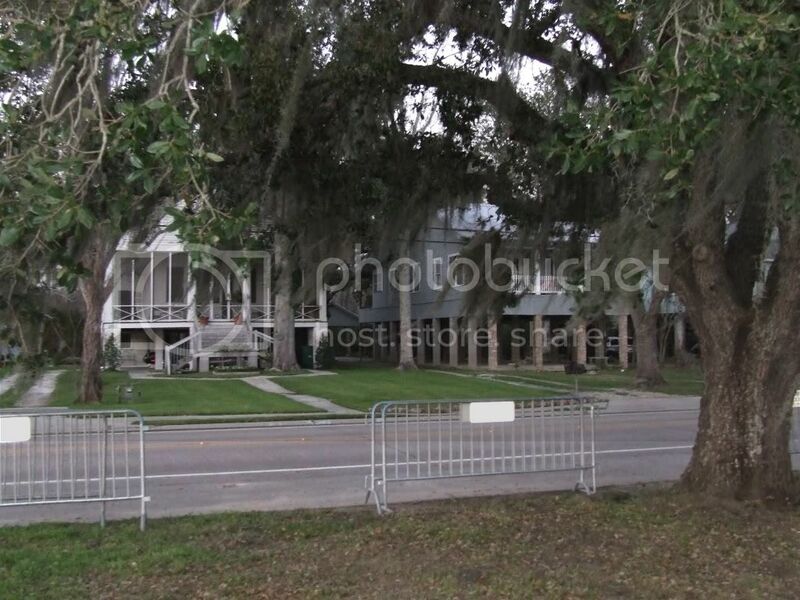 Southern homes and live oak trees along the lakefront - barricades for a parade of course! With winds coming out of the Southeast, we tacked back and forth and six hours later we were in our backyard. Since we weren't in any big hurry, we'd get Nirvana "in the groove" then just sit back and let her sail for a while until it was time to tack again. We don't have an auto-pilot yet, but we didn't have to sit at the wheel which was so much better! We just kicked back, listened to our favorite music, and enjoyed the day. Of course, sailing for the weekend didn't get anything out of our system. It just makes us want to go again! We felt like we were on vacation, and only spent about $7 in fuel! This past weekend was our first "destination" sail, whereas before we'd just sail around in the lake. We plan on spending many weekends sailing to nearby destinations, and venturing out a little further each time. We can't wait to get into the Gulf and sail to the Mississippi coast. Sounds like you had a great time, Ken and Cheryl. Sometimes the wind just doesn't cooperate! With unlimited time and patience, you can wait for the wind to pipe-up. However, most of us lack time or patience and sometimes both and the iron jenny gets put to use. Great photos, too! What a fun weekend. I'm glad you got to sail the weekend away. Good for you. It does get in your blood doesn't it. Yes it does. Sounds like a wonderful time and reminds me of a couple of our overnights on Logos. I can't let my husband read your blog any more because it would make him miss our boat too much! Sounds like a wonderful trip. Great photos, I love the overnighters! Be sure to get a couple (2) of oversized fenders, this will not be the only time you will find your boat being shoved against a solid dock. This is going to be a great Spring for boating!